There’s a lot to monster movies that goes back a couple of decades back when they were cheaply made B-movies with bad Asian dubbing and the cheesiest ‘special’ effects known to man, but it was the 80s and they didn’t know any better – bless their hearts. The only Godzilla movies that I’ve ever known was the one based in New York City that premiered in 1998, and then there was that unfortunate and ungodly movie that was Godzilla 2000 that should have never seen the light of day. Monster movies are usually hit and miss and you can look at Cloverfield and Super 8 as a couple of those movies that got it right in some areas, but unless you have a hard time dealing with shaky cam, then I wouldn’t recommend Clover. It’s the summer time (technically still Spring, but who’s keeping track), and ‘tis the season for mindless entertainment filled with action, generic storylines, and most importantly, the overall thrill of excitement. That’s been occupied by the Transformers, and countless Marvel movies that have dominated the box office in 2014, but those have depths and onion-like layers of back story, and a lot of times, you’re just in it to watch a movie. I’m here for you, the common movie goer, not among the elitist group that throws the thesaurus of describing a movie or depicting pie charts and analytical stats graphs to tell you who, what, where, when, and why so-and-so is happening. Russell Crowe once asked “Are you not entertained?! Is that not why you’re here? !” I think he may have been talking about the movies, and what’s a better entertaining movie than a good ol monster movie? Besides cars & superheroes – not many. When I saw the trailer for this movie, there was no denying that I was excited for it to come out. Godzilla? In the Summer? Come on – nothing but greatness was up ahead, and what were my expectations? I didn’t have much, because I just wanted to be entertained, and entertained I was. The story is the same as you’ve heard/seen forever, but I like how they twisted it to sway the perspective on the nuclear testing and whatnot (I won’t spoil anything). When the only creature you see in the trailer is Godzilla, you just think it’s another Monster trying to destroy the race of man while said race tries to destroy the creature. 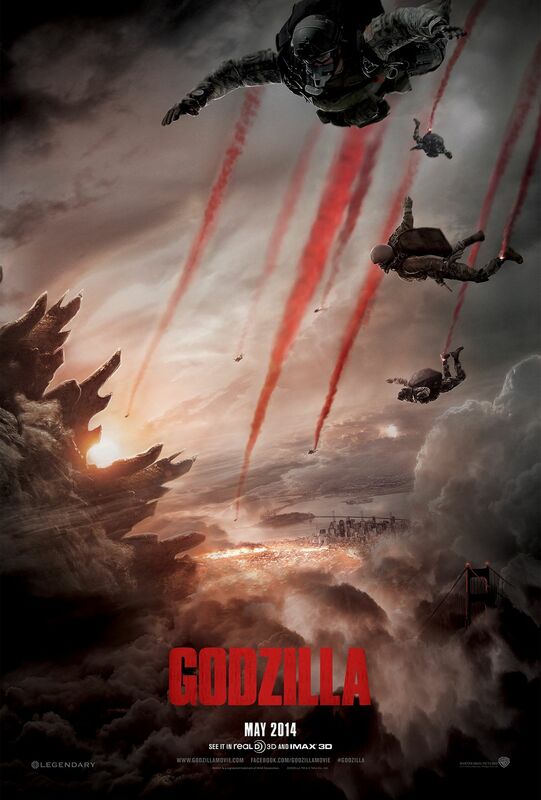 You’d think that, but when you watch it, it’s not what you expect, and that’s why I liked it, because it added elements from Godzilla movies of the past to bridge the gap and come up with something different while still giving it that appeal of an old school Godzilla movie.